1. 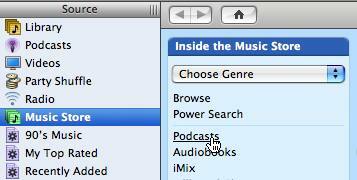 In iTunes, click “Podcasts”. 2. 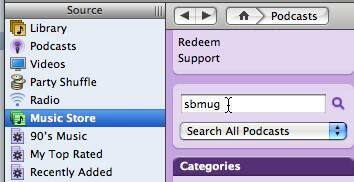 Scroll down to the Search box, type “SBMUG”, and click the magnifying glass icon to the right. 3. When SBMUG appears, click the “Subscribe” button. 4. To listen to a podcast episode, double-click it. Enjoy! 5. To unsubscribe from a podcast, select it in the Podcasts playlist, then click Unsubscribe at the bottom of the iTunes window.